which insist that furries, as a group, need to be explained. Some seek psychological explanations, suggesting that furries may be people with developmental problems or psychological conditions. Others assume situational explanations such as a broken childhood or a tumultuous, friendless, socially awkward childhood. After all, most furries have experienced significant bullying,2 and abundant psychological evidence shows that bullying, stigma, and concealed stigmatized identities can be particularly damaging to a person’s well-being. One would therefore expect furries to show evidence of significantly compromised well-being. 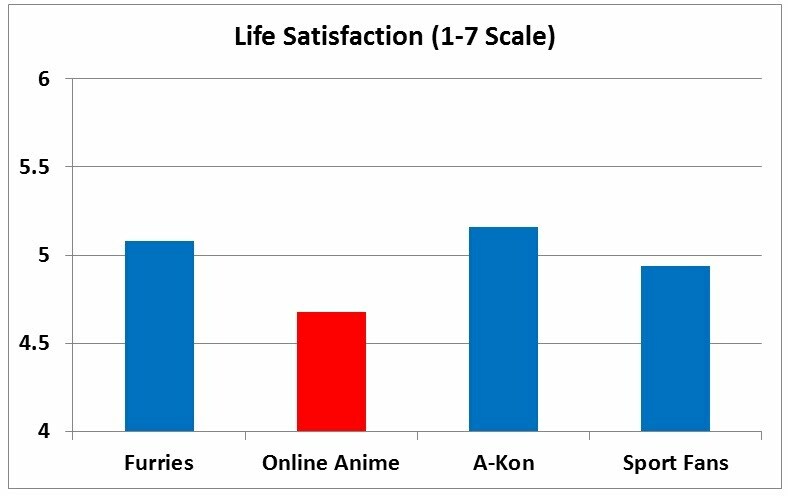 Taken together, these data, in conjunction with the rest of the data in Section 117, demonstrate that furries, contrary to popular misconceptions, are surprisingly well-adjusted. It’s worth noting that this lack of difference in well-being occurs despite the fact that most furries have a history of significant bullying. One possible explanation for this is the ameliorating role of the fandom: given that belongingness and acceptance are both important values in the furry fandom,8 as is compassion, helping, and global citizenship,9 for many furries, the fandom is a source of social support. Social psychologists have long recognized the important role that social support plays in building resilience and fostering well-being, and future studies are planned to test whether this mechanism explains furries’ tendency to thrive despite often enduring significant hardship.